Ski in/out gorgeous apartment - best location in Oz en Oisans - Alpe d'Huez. Chalet La Folie is a beautiful characterful two floored penthouse apartment with spectacular views. With sloping wood ceilings, a huge balcony, a fireplace and an open-style kitchen/living area with a dining table for 10 it is the ideal base for family or group skiing. We have WiFi, tv, DVD player, nespresso machine, private ski locker etc. Also access to shared pool, sauna, steam etc. The chalet occupies the fifth and sixth floors of 'Pic Blanc' building (with lift) facing the slopes, in the renowned Chalets des Neiges development (with great restaurant). You can ski directly into and out of the building. The chalet sleeps 10 in four bedrooms. On the first level there is a double bedroom with ensuite shower and two twin rooms (one with ensuite shower). Upstairs there is a bedroom for 4 with two twin beds and two mezzaine bunks - perfect for a family of four or as a 'kids' room. This room has an ensuite shower and toilet. There is an additional bathroom and separate WC downstairs. There are three sofa beds in the living room. (Therefore there are actually 13 beds, but we advise the chalet is most comfortable with up to 10). Exceptionally well located for skiing (ski in and out) this apartment is also within 2 mins walk/ski of the ski school meeting place, nursery slopes, shops (incl ski hire), supermarket, ski school office, crèche (up to age 6), tourist office and two fast queue-free gondolas into the huge Grandes Domaines (Alpes d'Huez) ski area. The area is also fantastic for walking and cycling (both mountain and road) in the summer with the lifts open July and August and there are many organised activities. This charming resort is car free so this is an ideal location for families as the entire village is skiable. Oz has its own ESF (bookable on-line) and other ski schools and fantastic kids' activities (including weekly kids' torchlight descent). We bought the chalet in 2014, having rented it for two years before that. The apartment is ideal for families and groups, the skiing extensive and the town most characterful. We can wholeheartedly recommend Oz as a fantastic convenient place to base yourselves. It is charming and pretty (unlike most purpose built stations) but completely safe for children given its size and the fact it is traffic free. The skiing is fantastic for all abilities. You can ski right down to the ski school meeting place, and get back on a gondola with the children without needing to take off your skis! Many people consider Alpes d'huez to be the best ski resort in Europe. There are runs for all abilities, from Marcel's farm (an easy fun zone for kids) to the super-feisty Tunnel, with all levels of run, and snowpack in between. For the less experienced, the nursery slope and kids area is on the doorstep. For the most experienced, you can try the 'grandes descent' from the top of Tunnel to the bottom of La Fare (two black runs which cover a significant drop in altitude without taking a lift. Oz en Oisans has easy access to the Alpes d'Huez via one gondola (which is in front of the chalet). The quieter area of Vaujeny is via a different gondola. Our property is perfectly situated in the beautiful, twinkling resort of Oz. We are in the centre yet on the slope. The chalet is spacious, characterful and has everything you need for a perfect break. Three showers en suite to three rooms, an extra bath and shower in the family bathroom and an extra separate loo. Metres away from the ski school meeting point, ski hire shops, nursery, nursery slops, two gondolas, shops, restaurants. Ski in/out yet all the convenience of the village as well. As we are built into a hillside you can ski in from above, and ski straight out the back door next to our private, lockable ski locker. For beginners, both gondolas & nursery slopes are moments away. Underfloor heating throughout. Also a free standing heater, clothes dryer and an open fire. One indoor space included. Plenty of other free parking. Small fitness room adjacent to swimming pool and sauna in chalet des neiges development - all for the use of our guests. The pool, sauna etc is housed in the adjacent Gentiane Building. Large open plan living room has two large sofas (can be used as sofa beds) with fireplace, TV, huge balcony with wonderful views, dining area for 10 and kitchen area. Cooker, hob, microwave, coffee machine, dishwasher, fridge freezer, toaster, kettle, all usual utensils supplied. Oz is in the enormous Grandes Domaines ski area. It boasts a huge skiable area for all levels. Two fast gondolas - each within 2 minutes of the apartment (almost always queue free) take you into the heart of the ski area. For beginners and children the village itself has a children's ski garden and nursery slopes with magic carpet and Poma, all accessible within 2 mins skiing/walking from our chalet. More experienced skiers can put miles under their skis by skiing the entire breadth of the Grandes Domaines from Vaujany, through Alpes d'Huez, to Huez village. La Sarenne is the longest piste in the world (black) but the Tunnel piste leads the way for festiveness! Alpes d'Huez offers high altitude snow sure skiing (the glacier open for skiing sometimes in July) and one of the highest skiable peaks in Europe (Pic Blanc) is accessible directly from Oz via three back-to-back lifts. Two tennis courts in village in summer (book at tourist office - free!). ONLY on the balcony . Pool for the use of Chalet des Neiges guests only (i.e. including our chalet which is in Chalets des Neiges development). In adjacent building. The chalet is in a great location. Although up some steps it is worth as the village is very small and friendly great for families. We left our skis and boots at the ski hire so did not have to carry them far. The ski lift is very close as bars and places to eat. The ESF ski school is excellent with good English speaking instructors. The chalet was great and comfortable enough space for the 8 of us. The kitchen is small and not shown in the photos but otherwise the balcony looks over the ski slope about 50 meters away. I would recommend and visit again. Thank you for your review and we're delighted you had a good time! We would be very happy to welcome you again and absolutely agree that the ski school is fantastic and the village great for families in particular. One point to note for future guests is that our (private, lockable) ski 'cave' on the second floor affords direct access to the piste. Our building is one of the closest to the Alpette gondola. So for most people in most conditions that would be more convenient than storing skis in the ski shop (and should mean no carrying skis!). But Romain, our manager who also works in the ski shop, is very happy to assist of you prefer to store them there. Thank you very much for the feedback and taking time to do review! There had been no snow for nearly three week's and we feared the worst but the pistes in Oz and Alpe d'Huez are so well maintained that nearly all the lifts and slopes were open and we had a fabulous week's skiing at the end of January. We were spoiled for choice and a week really isn't long enough to explore all the slopes available. Furthermore, the scenery around Oz is jaw-droppingly spectacular. We loved being able to ski to and from the apartment building and there were a couple of very good, reasonably priced restaurants just seconds away. The only two small negatives are the lack of wifi and the slightly awkward access to the apartment but these are definitely compensated for by the traffic free village and the superb skiing. We would definitely stay here again to enjoy more fantastic skiing and to explore the slopes we never had time to reach this time round! We spent four nights at the apartment with friends. Very comfortable and perfect for so many adults as there are 4 showers! The view from the balcony was stunning - on to the piste dropping into Oz and the main area of the resort. It was very comfortable with everything you need. The people looking after the flat in Oz were very friendly and located in the better ski hire place (called 3G). Excellent restaurants in Oz - including great home made tartiflette to take away from the supermarket. The skiing was fantastic - loads of choice - stunningly beautiful - and great food up there too. One of our bests meals was on the piste. Highly recommended ! We are planning to return next year. La Folie was absolutely prefect for our stay. The setting is stunning and all the amenities were nearby- supermarket, restaurants and bars. The accommodation was very spacious and was ample for our party of 9. Very comfortable beds and lovely dining/entertaining area. Also great to have a pool and sauna on site which we used and which were very nice. 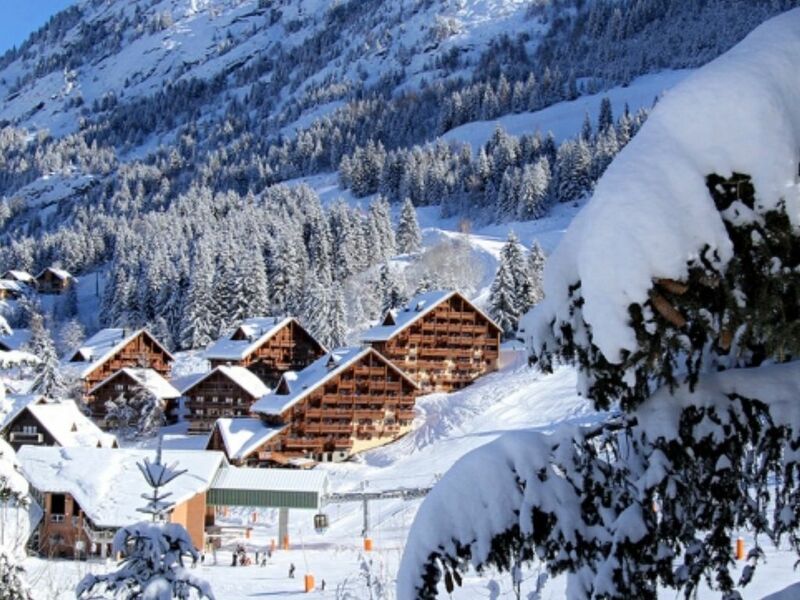 So convenient to be able to ski in and ski out and Oz en Oisans is a beautiful resort with really fantastic slopes - lots of variety for all levels of skiers. We had super snow so the conditions were great. I would highly recommend this and will definitely visit again. Despite not being able to drive to the door, the apartment was actually very easy to get to - a lift and some steps and a lift in the chalet itself. The apartment is well-appointed with lots of bedrooms and a spacious living/dining area. The location is fantastic - close to the pistes, supermarket and ski hire shops. Quite simply put, it is the best ski apartment I have stayed in, with some awesome skiing right on the doorstep. Thanks so much for taking the time to review and for your kind words. We're delighted you had such a good time. Skiing out the back door in one of Europe's biggest ski areas! There are two gondolas, a ski school and a ski kindergarten withing moments walk. Fast connections on queue free gondolas will have you in the heart of the Grands Domaines very quickly (see ski map). Or ski over to Vaujeny for sunny, quiet pistes. After millions of pounds of investment in advance of the 2014/5 ski season, Sarenne, reputedly the longest piste in Europe, is open throughout the season for a spectacular ski from the top of the glacier. Summer skiing is usually available from the end of June (as long as conditions permit - usually mid/late July). This is mountain biking Mecca: Oz regularly hosts the junior World Cup and the French national championships. All the equipment is hire locally. The apartment is close to many famous climbs. The Alpes d'Huez legendary 21 hairpins are nearby (accessible by gondola in the summer) as are many other famous landmarks and passes (including Col de Glandon, Col de la Croix de Fer etc). The nearest sizeable town (20 mins by car) of Bourg d'Oisans is a hub for road cycling. We have an arrangement with a knowledgable english owned biking business which can arrange drop offs and pick ups with bikes. The Oisans mountains provide a fantastic backdrop for all sorts of walks. From reasonably gentle 'top of gondola to top of gondola' hikes, stopping at mountain restaurants, to more extreme mountain adventures involving refuges and via ferratas, the Oisans mountains cater for all levels. Airports: Grenoble (1.15), Lyon (2 hours), Geneva (2.15 hours) or Chambery. We can help with transfers (from €50 pp return out of Grenoble) (or see Oz en Oisans public website for buses etc). From Calais: 9 hours driving. No car necessary (once you are there! ); car free resort with everything nearby. Allemond is nearest town for doctor, pharmacy etc: 20 mins down mountain. In summer, you may wish to drive to Bourg d'Oisans for cycling, canoeing etc - this takes about 30 mins. Grenoble 45 mins /1 hour. There are a number of bars,restaurants and pizzerias in the village. As well as the 'Sherpa' supermarket, there are a number of shops selling local produce and two boulangeries. There is a credit agricole cash-point. The tourist office, which sells lift passes and can also supply details and book of a wide range of activities (particularly useful in summer) is 5 mins walk from the apartment. The ESF office is next door to our development and the meeting place just below. We have a local representative who will meet you and hand over the key, be your contact in resort, and (as he also works in the local ski shop) assist with ski hire - including providing a discount :) We accept payment in £ or € as we have accounts in both countries so you won't pay any transfer fees. Changeover Day: Saturday changeover unless otherwise agreed in writing. Arrival from 4 (earlier by agreement), checkout by 10. Notes on prices: (From summer 2018 onwards): Rates include cleaning and all local taxes. Sheets and towels are extra if needed and can be reserved through our local manager (details on booking).